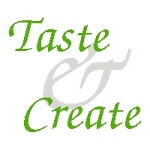 We thought we'd try something different and participate in the Taste & Create event (created by For the Love of Food). 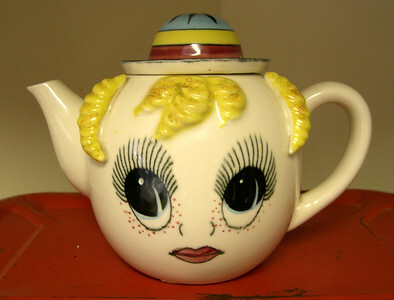 Each blog gets a partner and makes something from the partner's blog. In our case, we were paired with Stephanie from Fun Foods -- On a Budget! We're not really big bakers, so we thought we'd try something new-ish and make hamburger buns. bun in the oven, done! Stephanie was correct: this was a very simple yet successful recipe. The bun was soft and slightly sweet. Very nice. Ours still tasted a bit yeasty, though, so I don't know if that was intentional. In any case, we didn't mind the yeasty flavor; after all, isn't that what bread's supposed to taste like? Once we knew we were making these buns, we brainstormed ideas for fillings. I think what we have is quite exciting! (Well, at least, I think it's super-duper-exciting.) Stay tuned! This event is created by created by For the Love of Food to promote community, sharing, tasting, and blogging. Our partner blog: Fun Foods -- On a Budget! I make a lot of bread but have never had much success with rolls/buns. Always a bit hard or doughy. I have never used all purpose flour so maybe that is why. I will give these a whirl. Wow, these look great. 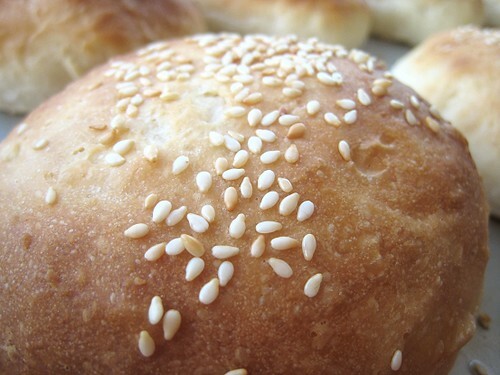 I never thought of making buns before and I love the sesame seeds on top. My family makes bread and buns with sesame seeds...it's the norm for us and hey...make for a good home burger too! omg this looks amazing!! 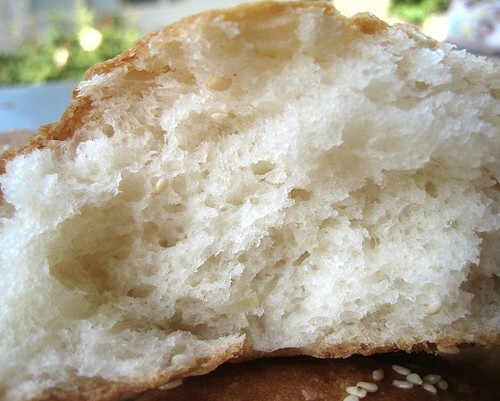 I am so hopeless with baking and right now i am so impressed with how pretty and delectable these sesame seed buns look! Very nice! I love the golden color! Glad you like the rolls - we've made them several times and I think they're just great! The sesame seeds look like a nice touch. This seems like a nice recipe to try. I'm also not very big on baking and am reluctant to undertake most baking tasks out of fear/laziness. I like they way these turned out though. And buns are spectacular, general, you know? "...out of fear/laziness": haha, that sounds exactly like us! These were nice and simple: no kneading involved! And the rising time wasn't too long, especially if they're put in a warmish place. Oh, we didn't know about the yeasty taste in regards to dry yeast. We're quite unknowledgable about yeasts and how each different kind differs from each other. 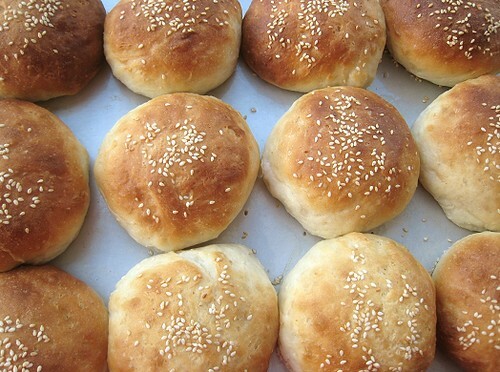 Those sesame seed buns look nice and light and fluffy and good. Very impressive! I'm going to try these. Your buns look gorgeous! There's nothing better than homemade bread! The pics looks really tasty! Your buns look awesome! THAT is what a hamburger bun is supposed to look like. Great job! I will grind some fresh bison and give those beautiful buns a try. 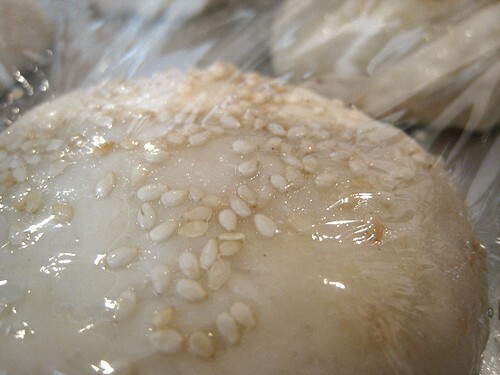 Those buns look nice and fluffy :) Sesame seeds are always a nice touch. Wow, thanks for the feedback!